University of Missouri, 9780826217011, 384pp. The twentieth century was preeminently an age of warring states and collapsing empires. Industrialism brought not peace but the sword. And the tip of that sword was sea power. In Power at Sea, Lisle A. 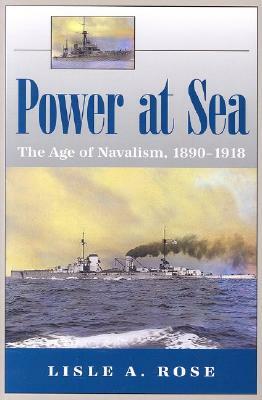 Rose gives us an unprecedented narrative assessment of modern sea power, how it emerged from the Age of Fighting Sail, how it was employed in war and peace, and how it has shaped the life of the human community over the past century and a quarter. In this first volume, Rose recalls the early twentieth-century world of emerging, predatory industrial nations engaging in the last major scramble for global markets and empire. In such times, an imposing war fleet was essential to both national security and international prestige. Battleship navies became pawns of power politics, and between 1890 and 1914 four of them--Britain’s Royal Navy, the Imperial German Navy, the Japanese Navy, and the U.S. Navy--set the tone and rhythm of international life. Employing a global canvas, Rose portrays the increasingly frantic naval race between Britain and Germany that did so much to bring about the First World War; he takes us aboard America’s Great White Fleet as it circumnavigated the world between 1907 and 1909, leaving in its wake both goodwill and jealousy; he details Japan’s growing naval and military power and the hunger for unlimited expansion that resulted. Important naval battles were fought in those days of ostensible peace, and Rose brings to life the encounters of still young and relatively small industrial fighting fleets at Manila Bay and Tsushima. He also takes us into the huge naval factories where the engines of war were forged. He invites us aboard the imperial battleships and battle cruisers, exploring the dramatically divided worlds of the officers’ lordly wardroom with its clublike atmosphere and the often foul and fetid enlisted men’s quarters. The Age of Navalism climaxed in the epic First World War Battle of Jutland, in which massive guns and maneuvering dreadnoughts determined that Imperial Germany would become the latest in a line of ambitious naval powers that failed to shake Britannia’s rule of the waves. Germany’s subsequent use of a revolutionary new strategy, unrestricted submarine warfare, nearly brought Britain to its knees, reduced the level of naval combat to barbarism, and brought the United States into the war with its own substantial navy, ultimately turning the tide of battle. Focusing as much on social issues and technological advances as on combat, Power at Sea: The Age of Navalism tells a compelling story of newfound power that is fascinating in its own right. Yet, it is merely a prologue to more startling accounts contained in the author’s succeeding volumes. Lisle A. Rose holds a Ph.D. in American history from the University of California, Berkeley, and is the author of fourteen books, including Explorer: The Life of Richard E. Byrd and the Power at Sea trilogy, all published by the University of Missouri Press. Over the course of his life, he has been a sailor, a professor, a diplomat, and a court-appointed special advocate for at-risk children. He lives in Edmonds, Washington, with his wife, historian Harriet Dashiell Schwar.Full bio: Lisle A. Rose (b. October 23, 1936) is a retired U.S. State Department official, former university teacher and author of 14 books. Following three plus years in the United States Navy as a polar sailor, Rose received his B.A. degree from the University of Illinois in 1961 and his Ph.D in American history from the University of California Berkeley in 1966. Following several teaching positions, he joined the State Department's Historical Office in 1972 where he spent the next five years editing various compilations in the ongoing series, Foreign Relations of the United States. In 1978, Dr. Rose transferred to the Department's Bureau of Oceans, International Scientific and Environmental Affairs where he served first as Polar Affairs Officer and then as Advanced Technology Affairs Specialist. During these years, he was a member of the U.S. Delegation to the Third United Nations Conference On the Law of the Sea, and drafted policy initiatives on the Arctic and earth remote sensing. He also lectured on these topics abroad. Rose retired in 1989, relocating to the Seattle area where he has engaged in an active writing and publishing career.